Students in Visiting Assistant Professor Hilary Snow’s ARTHIST 341: Seventeenth Century Art in Holland and Flanders visited the Peck School for the Arts to learn how Rembrandt made prints. Assistant Professor Jessica Meuninck-Ganger led a hands-on demonstration based on Rembrandt’s self-portrait etchings. 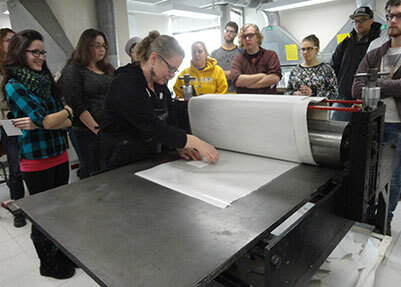 Students participated in the entire print making process from etching the matrix to pulling the print.